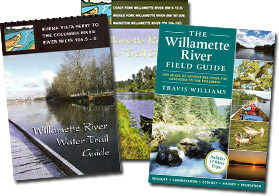 Grab a paddle, and discover the remarkable Willamette River – on the Willamette River Water Trail! Flowing through forests, meadows, parks, farms, and cities large and small, our nationally recognized water trail connects communities and visitors to Oregon’s celebrated Willamette Valley, and provides an accessible adventure in the heart of the Pacific Northwest. So go ahead, soak it up! We are thrilled to share that in early 2018, Willamette Riverkeeper received a wonderful donation of 107 acres of riverside land to be known as The Nicol Sanctuary. This new WR Greenway property is a few miles downstream of Willamette Mission State Park in Yamhill County, and spans the shore from river miles 64 to 63 on your map. We have been actively removing invasive weeds from the property, and are developing plans for additional habitat restoration work and hiking trails. Currently, you may enjoy a primitive Water Trail campsite, either on the large gravel bar (during the dry season), or just inside the treeline where you can enjoy more shade. This beautiful print takes inspiration from the iconic 1930s era WPA posters which depicted National Parks, Monuments, and Natural Areas with the goal of encouraging the public to seek out these special places. In that same vein, we created this work with local graphic designer, Chris Marron, to celebrate your very own “187 Miles of Wonder.” Now go explore! While you won’t find this “secret” Water Trail site identified on your Water Trail map, Tripp Island is a great place to camp or enjoy a quiet lunch break. At the time the maps were printed, it was not known that this property was owned by Oregon State Parks. Enjoy a swim or hunt for agates, and as always, please Leave No Trace. Get dirty for good at the 10th Annual Great Willamette Cleanup: 187 trash-bagging miles of rampant do-gooderism by river rats who believe rivers aren’t landfills. This river wide, paddling-based cleanup will boost your river karma, and the health of your homewaters: October 6th, 2018. Sponsorship opportunities are available now! Registration will be posted in September. Vist here for more details.